Well we're going to give you the basics of how this can be achieved. First you need to create a form and name it (how to create a form). 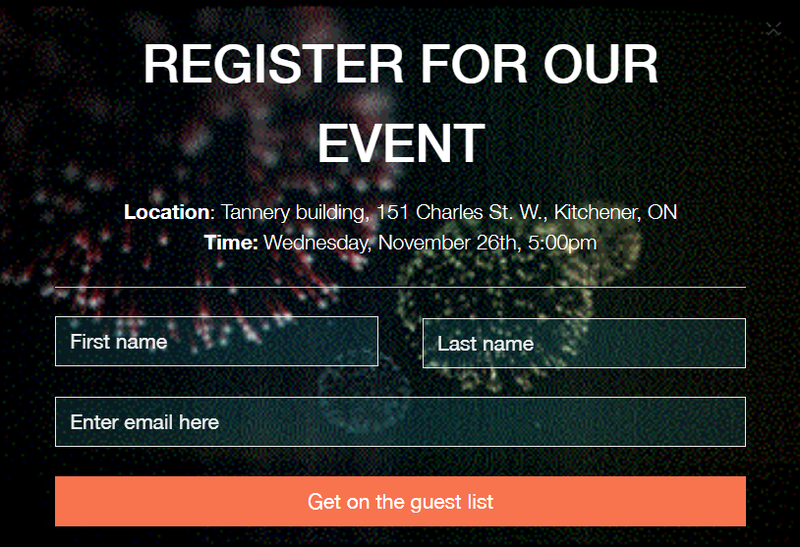 In the description text, give details on the event and why someone may want to go. Really make it enticing. Drag in a name field and an email field. This is where things start to get fun. You can really play around and make this your own. The default looks nice, but you might want to add you own branding to it. The form above, for example has a background image. We used this: https://media.giphy.com/media/1aLCseU42GUfK/giphy.gif but you can use anything you want. We made the submit button a salmon color, and changed what it said. We used Traditional Fields (found under the design tab). Additionally we removed the Progress Bar (also found under the design tab). We removed the Field Labels (how to do this) and used placeholder text to direct people in filling out the form. Finally, we uploaded this CSS document to where it says Upload Custom CSS. Feel free to play around! How to make a pop-up. How to make a slide-up. Or just leave it as an inline form and embed it straight into the body of the page.